Achillies Tendinopathy | WILL I EVER DANCE AGAIN? A tendonopathy affects the tendons of the body. A tendon connects muscle to bone and is a continuation of the muscle. 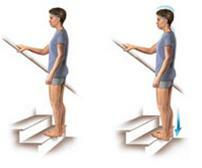 It is therefore involved in movement with the contraction of muscles. A healthy pain free tendon is strong and has its fibres lain down to form lines of strength. (Imagine a bundle of dry spaghetti…)When a tendon, in this case the Achilles tendon, becomes injured it takes on more fluid, swells and ends up looking more like wet spaghetti!! The cells get disorganised as they starte to be replaced and the tendon therefore loses its strength. It may also develop a swollen lump/nodule normally found towards the bottom third of the tendon as it passes behind the ankle bone that can be painful to touch. How Do I Know If I Have It? – Common Symptoms A lot of people think they have problems in their Achilles Tendon when the problem is really a Posterior Impingement or Os Trigonum so an accurate diagnosis is essential. People with problems in their Achilles often notice it most first thing in the morning, finding it hard, or painful, to put their heels down. Pain can be felt in the tendon on rising or en fondu at the start of class, but often starts to feel better as you warm your way into it. Long-term overuse of the Achilles tendon, and resultant thickening and damage, is normally a result of poor foot and hip mechanics. This can often come from the foot pronating (collapsing in) and causing too much stress on the tendon. It can also occur if the rest of the leg is not absorbing the load effectively in jumps, or if the heels are not lowered to the floor. This chronic overuse and resulting weakening and change in structure of the tendon may be accompanied with a nodule/lump in the tendon which can be felt in the mid portion of the tendon and is often tender to touch. Treatment pof Achilles Tendoopathy may include but is not limited to… Assessment and correction of any weaknesses in core and pelvic stability, retraining of the intrinsic foot muscles, massage and mobilisation of the foot and ankle, specific taping techniques to offload the tendon and correct the alignment of the foot. Often Eccentric training exercises are given to help correct the alignment of the fibers in the tendon. 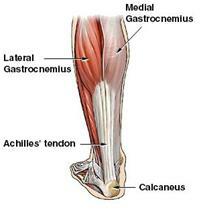 All cases of Achilles Tendonpathy are different, so there is no one treatment protocol. Every dancer must be individually assessed by a qualified therapist to determine the full and correct course of treatment.